I love experimenting with different grains and flours. Jowar, Nagli/Ragi,Amaranth, Corn etc.. are pantry staples in my house. 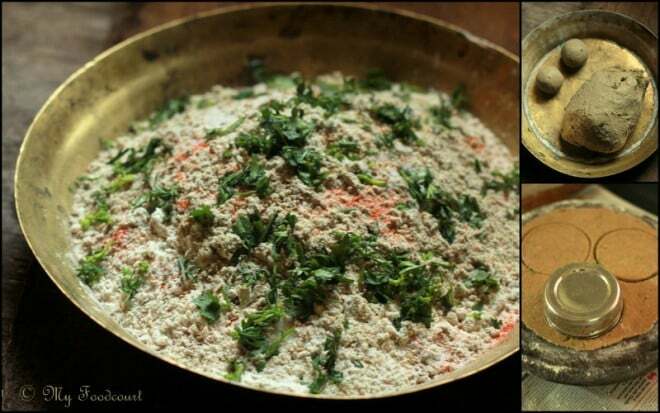 Most of the times,I use a blend of these grains for our day-to-day food in the form of khichdis, upmas,dosas. 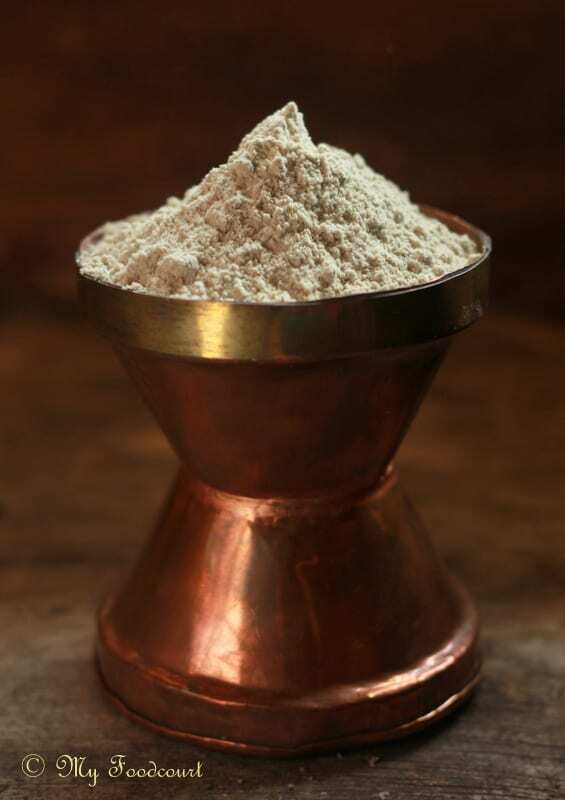 One such multipurpose, wholesome flour mix is the ‘Thalipeeth Bhajani. 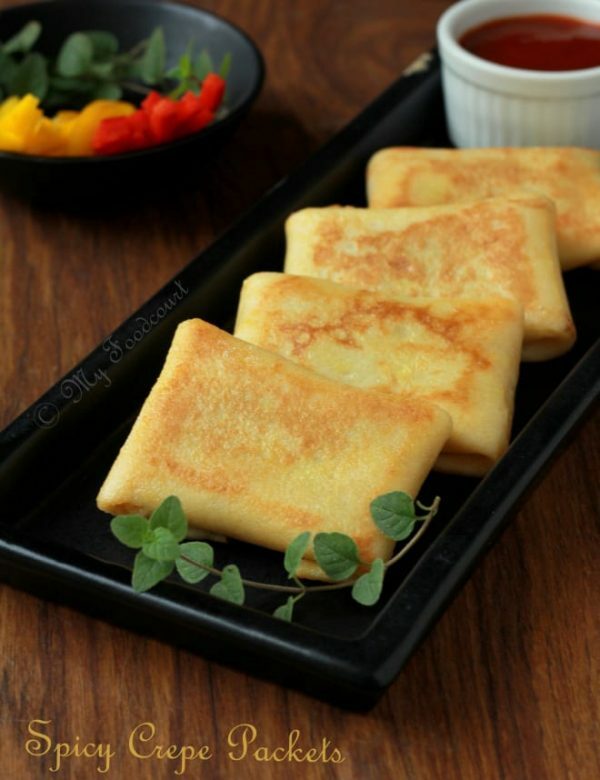 This is a pantry staple in every Maharashtrian household. 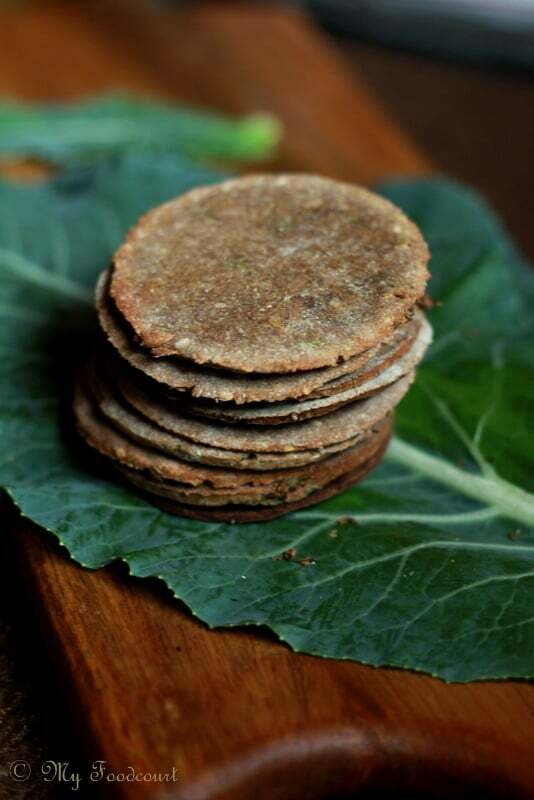 Bhajani Thalipeeth basically is a quick flat bread made using this multigrain Bhajani mix along with chopped onions,sometimes some chopped fresh or leftover vegetables, fresh coriander, sesame seeds and spices.It is usually served for breakfast with fresh homemade Curd/Yogurt, homemade white butter and/or sweet lime pickle. 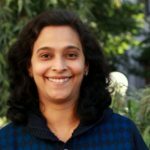 My Mom makes her own Thalipeeth Bhajani by roasting – Jowar, Bajra, wheat, Nagli,Rice,Gram dal,Urad dal and cumene , coriander seeds and then milling them together. 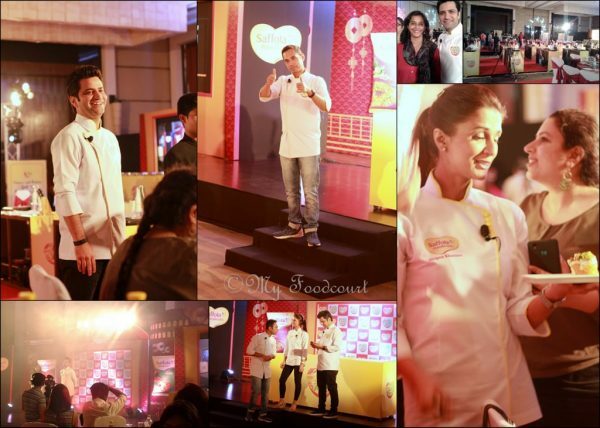 Needless to say I get my Thalipeeth Bhajani mix readymade from her as and when I am out of stock :). 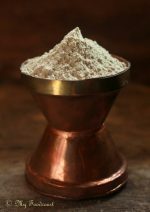 Most supermarkets, grocery stores, health food shops now stock Thalipeeth flour, so it is easily available or see the Quick Mix version given below. 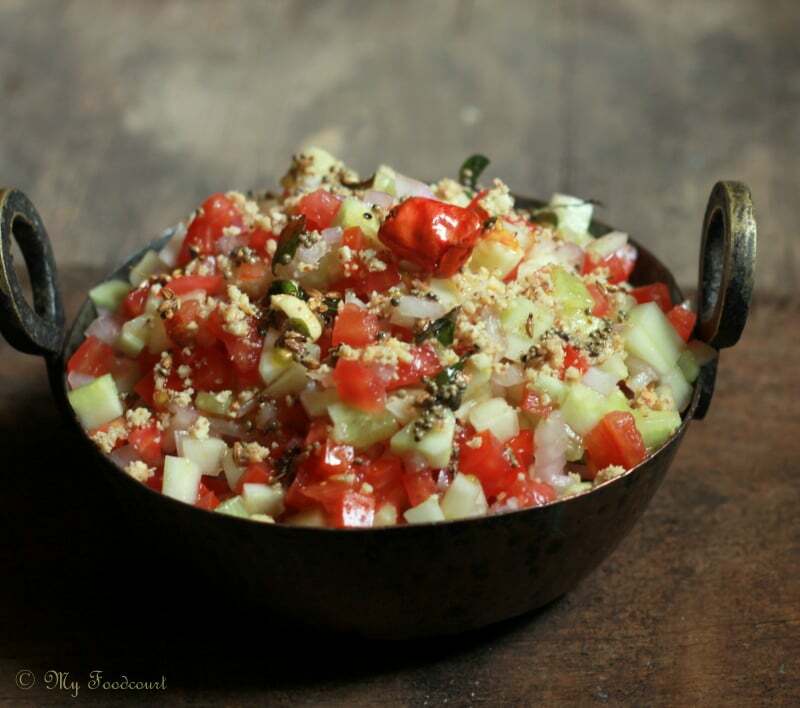 Another favourite item from the Maharashtrian cuisine is ‘Khamang Kakdi’ – cucumber salad tempered with spices and topped with crushed peanuts. I love to add Tomatoes and onion to my Khamang Kakdi. 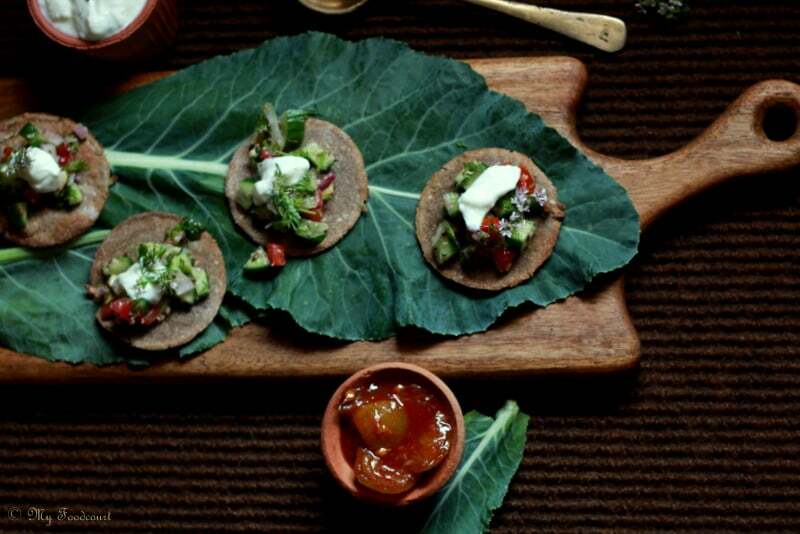 Both these Classic Maharashtrian favourites, I have combined in a quick modern Appetizer Avatar- Mini Thalipeeth Tostadas, akin to the Mexican Tostadas. It seems to be a long winded recipe but it uses simple day-to-day ingredients found in most Indian kitchens.With some advance preparation it can be easily put together in under 30 minutes. 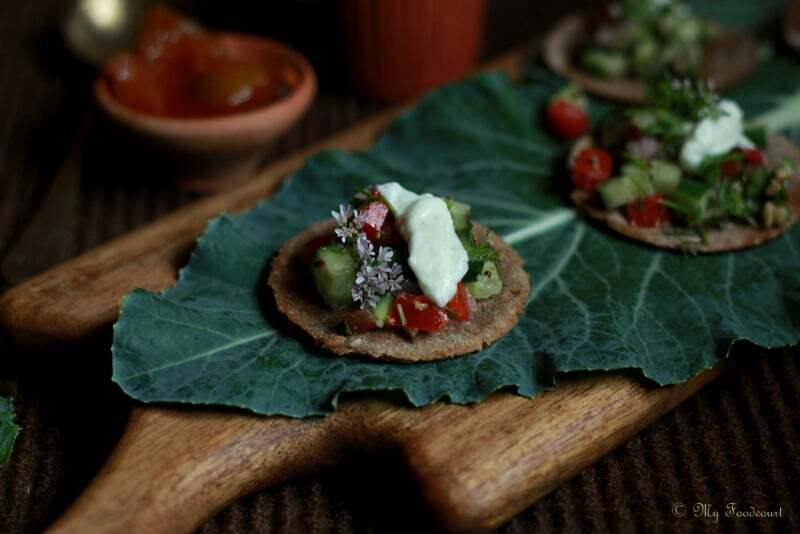 I have used Fortune Rice Bran Health Oil for making my Mini Thalipeeth Tostadas. “Fortune rice bran health oil has a key micronutrient called “oryzanol”, an antioxidant found only in the bran of rice. It helps reduce bad cholesterol,increase good cholesterol and keeps your heart healthy, making it a healthier choice. Squalene is an organic compound naturally produced by human skin cells and is a natural moisturizer. Fortune Rice Bran Health Oil contains good amounts of it which prevent the ageing of skin. Antioxidants improve health by fighting free radicals that harm the immune system. Fortune Rice Bran Health oil has natural antioxidants that help build strong immunity”. 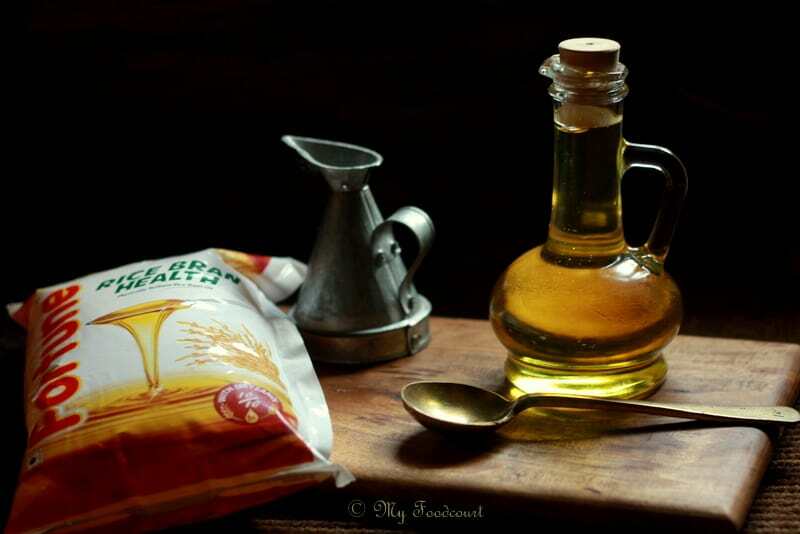 “It is a myth that colourless or transparent oils are healthier than dark oils. FRBH is refined optimally to keep all the essential micronutrients intact. It has a darker appearance primarily due to Oryzanol. Preheat the oven to 170 deg C.
Add the flour or flours to a mixing bowl. Add all the other ingredients except the water.Mix well. Slowly add the warm water and knead the flours into a stiff but pliable dough. Roll out into a thin layer. The layer should be as thin as possible while still workable. Cut rounds using a 3u201d cookie cutter/ sharp edge of a small steel Dabba. Note: These can be made well in advance. Can be stored in an air tight container for about 2 weeks. Mix the cucumber, tomatoes, onions in a bowl. In a small Kadhai/pan add the oil. Once hot, add the mustard seeds. Once the mustard seeds crackle, add the cumene seeds, Asafoetida, curry leaves and green chillies. Pour this over the Cucumber-tomato-onion mixture in the bowl. Add the chopped coriander and mix again. In a small bowl mix together the Yogurt and the herbs. Season with Rock salt and mix well. Keep the crispy Thalipeeth Tostadas on a large serving plate. Add 1xbd- 2 spoonfuls of the Koshimbir Topping.